Managed Test Service of Test Yantra provides value additions which are unique and are un-matchable. Our services will help to reduce the labour cost and reduce the capital investment at the outset. It will eliminate the need to invest on infrastructure and also helps to increase the productivity and accuracy. Traditional software engineering lack seaming co working Correlation between Development, Testing and Operations Teams. Manually deployment of code, or developing code that doesn’t have automated testing, leading to the building up of technical Liability. Lack of coordination between teams leading to unplanned work and same mistakes being repeated, resulting in loss of time, effort and money, and business/revenue too. 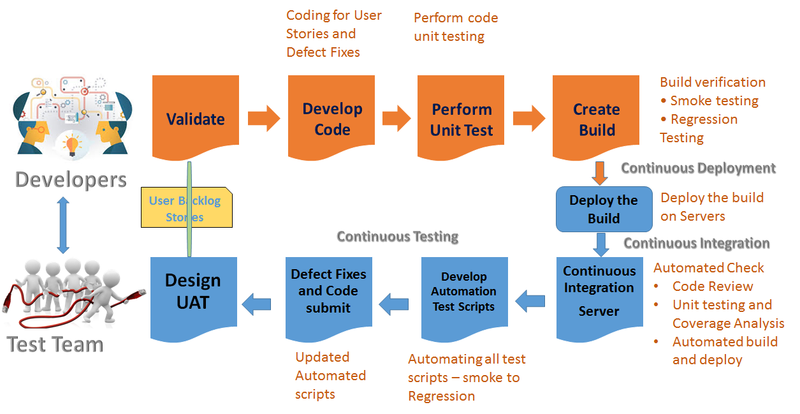 Automate all pre-testing tasks, test case, test script etc and align with the Continuous Integration cycle. TYSS follows the approach of SHIFT LEFT testing, whose prime focus is on quality and to work on defect prevention than defect detection, by early adaptation of fail fast and fail often with respect to functional defects testing in the software life cycle. We create a continuous testing approach that traverse thru the complete CI and CD cycle. We take responsibility of automation beyond builds and integrations, to include automated solutions for development (unit testing) and ops (configuration management). With this practice we shift the integration testing to a step left in the delivery pipeline in the build process. Which helps us to test error prone integrations early and frequently, in turn help in isolating the significant defects sooner for quick resolution. SWIFT QUALITY – with continuous testing and development, we achieve faster, more accurate results with less problems. Noticeably avoid any kind of rework, any delays and avoid detecting defects in later stages of testing cycle.